The aim of the challenge is to go back to the days of the preserve, pick an ingredient, seasonal or not and treat it as if you won’t be seeing it again for quite some time. Syrups, sorbets, jam, shrubs and the like are all fair game, anything that will preserve the integral character of your favourite ingredient. With that in mind we searched through our pantries to see what sort of preserved ingredients we had. Read on to discover what we came up with. Shake ingredients with ice. Strain into a glass. Top with another 1/2 oz of ginger meringue (add more if you like your drinks sweeter and creamier). Stir gently a few times to encourage the meringue to spread out on top of the drink. 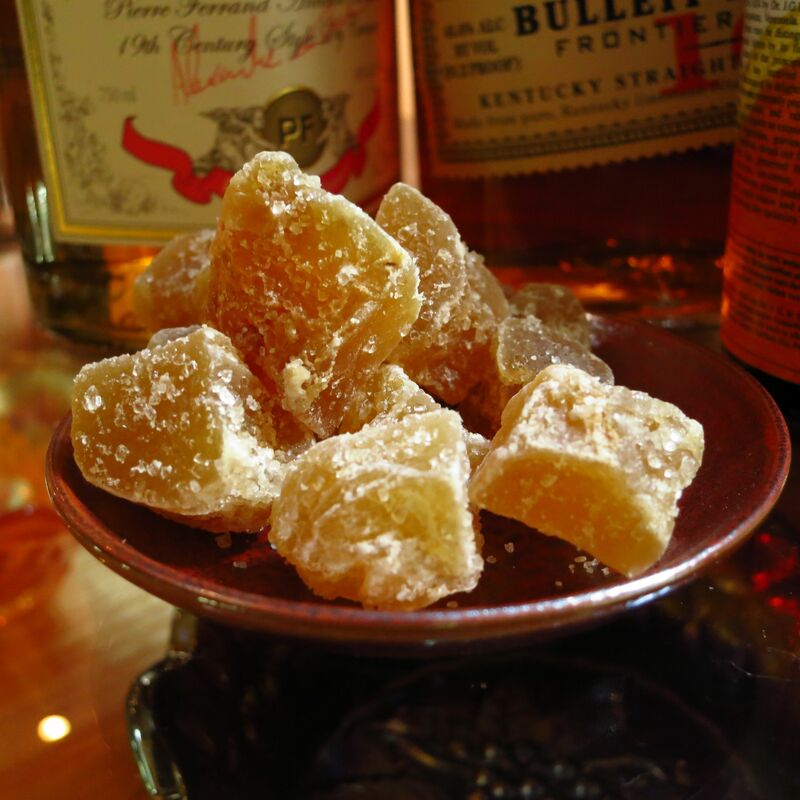 Garnish with a cube of crystalized ginger. When we finished with the State Fair Sour, we opened the fridge and stared at what was on the door for a while, and experimented with a few things. First we tried Major Grey chutney. It didn’t mix well with anything. Then strawberry preserves. They got lost in the mix. 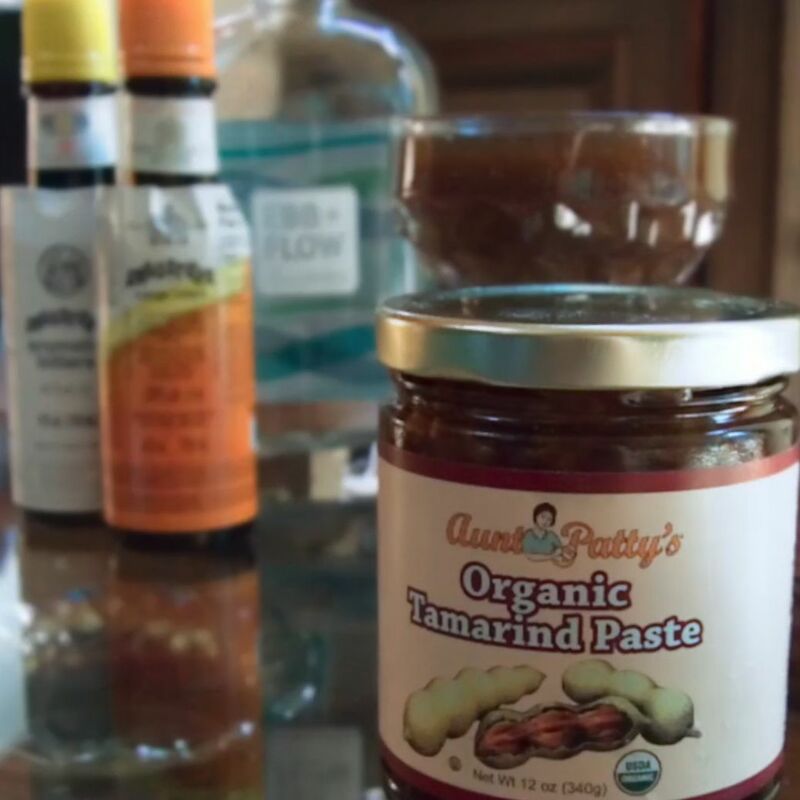 Finally, we focused on a jar of tamarind paste. Bingo! It has a strong sweet-sour, earthy, fruity flavor that we thought would stand up in a cocktail. We tried it with a few different spirits, but settled on vodka to let the tamarind flavor stand to the fore without interference. Stir all ingredients to dissolve the paste. Shake hard with ice. Double strain into a glass. Enjoy! Nose: Orange, sweet grain notes from the vodka, tamarind. The tamarind is earthy and sweet with a hint of a sour pickled smell like umeboshi. Palate: Sweet tamarind leading into bitter orange and earthy, jammy tamarind on the mid-palate. Aromatic coffee and cooked fruit flavors on the finish. Light, sweet vanilla grain notes throughout. Thanks to Craig for hosting this month and many thanks to Fred Yarm for continuing to carry the MxMo torch. We were very happy with how both cocktails turned out. We rarely reach for preserves when making drinks, however they open up all sorts of possibilities, so we were glad the challenge made us look in this direction. We thought about doing something with cornichons but didn’t get to it. Perhaps next time. 🙂 We think they’d make a lovely riff on a martini-like drink. Mince ginger very fine. Bring egg white to room temperature and whip for 1-2 minutes. Add ginger and whip until very frothy and setting up a little. Mix water, sugar, and cream of tartar, then boil until sugar dissolves. Cover the pan and let sit for 2-3 minutes to wash any sugar crystals off the side of the pan. Slowly pour sugar syrup into egg whites while whipping constantly, 3-4 minutes. Let mixture cool to room temp, then whip another 3-4 minutes, until it has a semi-set texture like marshmallow fluff. 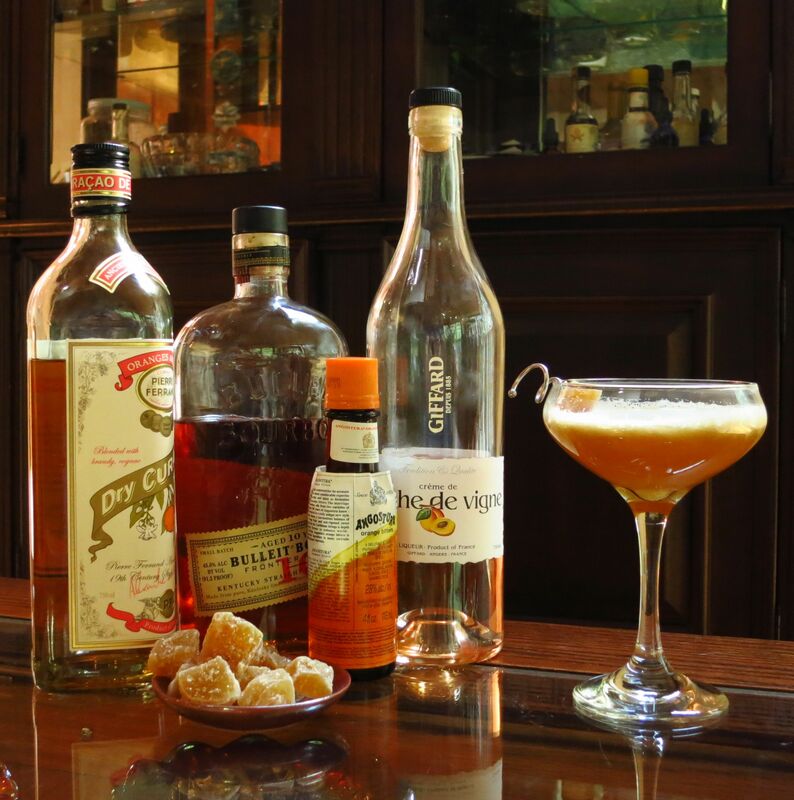 This entry was posted in bourbon, curacao, peach brandy, vodka and tagged fourteen shillings cocktail recipe, state fair cocktail recipe. Bookmark the permalink. Glad you like them! We’d love to hear what you think if you get around to trying either of them.